London, 7th June 2017 – Canon Europe, world leader in imaging solutions, has launched its new varioPRINT 140 series of production printers, demonstrating a continued commitment to investment and innovation in the monochrome digital print market, and delivering substantial productivity gains compared with previous devices. Building on the product heritage of its predecessor, the varioPRINT 135 series, the new varioPRINT 140 series offers unrivalled uptime and productivity, outstanding monochrome print quality, extended finishing options, all optimised by the introduction of the new Océ PRISMAsync 5 controller. The varioPRINT 140 produces no ozone, underlining its sustainable positioning in the market. varioPRINT 140 Printer PIM Decurl HCS HCS Set FSL 02The new varioPRINT 140 is capable of printing 143 images per minute in both simplex and duplex modes, making it the fastest printer in the light- and mid-volume production segments. The printer can deliver monthly print volumes of up to 800,000 copies, more than doubling productivity compared with the varioPRINT 135. Together with the varioPRINT 140, new varioPRINT 130 and varioPRINT 115 models are also being introduced, offering speeds of 133 and 117 A4 images per minute respectively. The introduction of Océ PRISMAsync 5 technology further boosts productivity, using remote printer driver technologies to enable production planning and job scheduling up to eight hours in advance. The remote app is downloadable to a smartphone or personal tablet, and allows operators to focus on other tasks while receiving real-time notifications of upcoming operator actions, such as loading media or adding consumables, or alerts of immediate actions needed. One or multiple PRISMAsync Print Server-driven digital presses can be monitored at a glance, helping expedite manual interventions to increase device uptime and productivity. PRISMAsync 5 offers new impositioning possibilities, such as layout, trim and cover, alongside an embedded JDF/JMF interface. The new controller also enables PSPs and in-house print departments to work more securely, thanks to a configurable user interface which allows for audit logging and back-up and restore capabilities. New features such as page numbering, special book copy functionality and an intuitive copier interface improve usability, particularly in ‘walk-up’ environments. Building on its increased output capabilities to automate the manufacture of most print products, the varioPRINT 140 series offers a full range of in-line finishing options, including stapling, saddle stitching, folding, die punching, inserting, ring binding and high-capacity stacking. The new W1 booklet finisher offers a new saddle stitch option for flat finished booklets, while the updated F1 booklet trimmer expands customers’ trimming capabilities. 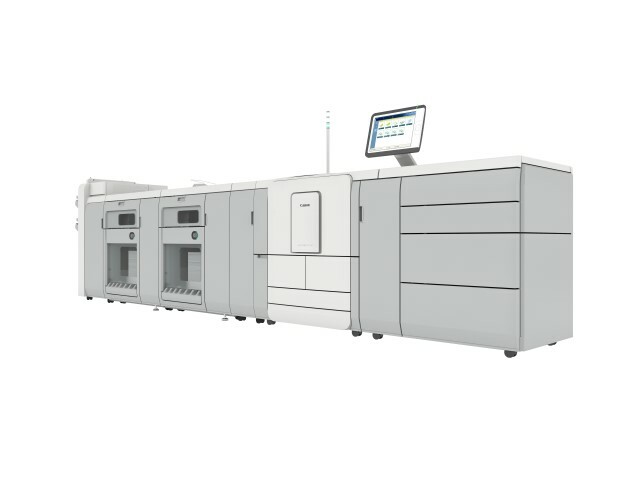 A new professional punch is available, offering A4+, A3 and A4 SEF punching in one model, and with the capability to handle heavier media up to 300 gsm. The open Document Finishing Device (DFD) Interface also enables in-line connectivity to specialist, third-party finishing devices. For back-up or walk-up environments, the new printer features a simplified catch tray enabling a simple ‘no finishing’ configuration. The varioPRINT 140 gives users a comfortable work environment, producing no ozone and virtually no waste toner. Energy consumption is reduced using HeatXchange technology, which recycles the heat used to fuse toner onto paper. The low fusing temperature also allows printing on a wide range of media. The varioPRINT 140 builds on the strong product heritage of the varioPRINT 135, which achieved a ‘Five Star’ image quality rating from Buyers Lab (BLI), the global document imaging industry’s resource for unbiased, independent research and data. The new product incorporates the same defining varioPRINT series base technologies, including: Canon DirectPress, which converts digital data into a toner image in a single step, providing a uniform and stable image; Canon ScreenPoint, which automatically converts colour images into grayscale images with excellent resolution; and Canon EnergyLogic, which helps increase productivity by heating up for heavy media or cooling down for light media, providing non-stop production for mixed media jobs. With more than 2400 devices installed in EMEA and over 4500 worldwide, the varioPRINT 135 has been instrumental in helping many businesses to introduce efficient on-demand production of dynamic documentation such as product instruction manuals. Industrial combi-steamer manufacturer RATIONAL AG, for example, uses the varioPRINT 135 to produce individual product instruction booklets in 70 languages, printing 22,000 A4 pages per day and eliminating the need to curate an inventory of printed documentation. The 98% uptime achieved with the varioPRINT 135 is business critical, as no equipment can be shipped without its supporting documentation. The varioPRINT 140 series is available from early Summer 2017.